Stainless Steel Exhaust Y Pipe Adapter Connector 2" Single to 2" Dual. Type:Exhaust Pipe. 1Pcs exhaust pipe. -304 stainless steel, acid and alkali resistance, high oxidation resistance, durable, easy to clean. Stainless Steel Exhaust Y Pipe Adapter Connector 2.25" Single to 2.25" Dual. Type:Exhaust Pipe. 1Pcs exhaust pipe. -304 stainless steel, acid and alkali resistance, high oxidation resistance, durable, easy to clean. Size : Length 7 1/5" (180mm). Improve The Look Of Your Vehicle. For best results seal the sleeves at each end with adhesive foil tape, shrink tube or stainless steel cable ties. To ensure a proper fit, allow extra room for bends ( for example: a 90º bend in a 3/4" tube will NOT fit in 3/4" I.D. Sleeve, In this case you would need 1" I.D. or higher ). 2"/52mm Stainless Exhaust Adapter Sleeve Pipe Repair Connector. Suitable for a 2" (52mm) Tube/Pipe. quantity:1Pc Exhaust Connector. 5m Exhaust Header Wrap Insulator Turbo Pipe High Heat Tape. Size: 5m x 5cm x 2mm. Color: Silver. 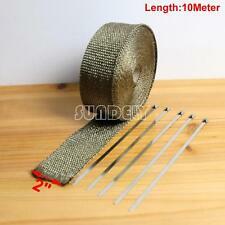 10M Exhaust Header Wrap Insulator Turbo Pipe High Heat Tape Titanium Golden. Size: 10m x 5cm x 2mm(approx). Color: Titanium Golden. Material: Glass Fiber. Flange Kit Height: 17.9mm(2x Flange 35.8mm). Clamp Height: 22mm. Material : Stainless steel & iron. -Instruction is not included. Universal Insert Removable Stainless Steel Exhaust Silencer Muffler Killer. Tip muffler size: 4". Effectively reduce loud and deep tone from muffler. 1x Tip Muffler. Thread pitch:1.3mm. Material: T-304 Stainless Steel. Electric Cutout Kit - Made of Lightweight CNC Machined Anodized T-6061 Aircraft Aluminum Alloy. 1 x Electric Exhaust Cut Out Kit with Gear Driven Motor only ( No Instruction Included ). Design your own Y-pipe and use your own switch. Stainless Steel Exhaust Y Pipe Adapter Connector 3" Single to 2.25" Dual. Type:Exhaust Pipe. 1Pcs exhaust pipe. -304 stainless steel, acid and alkali resistance, high oxidation resistance, durable, easy to clean. Size : Length 7 3/5" (190mm). Improve The Look Of Your Vehicle. Size: 10m x 5cm x 2mm(approx). 10 m Exhaust Header Wrap Insulator Turbo Pipe High Heat Tape Blue. Color: Blue. Universal Insert Removable Stainless Steel Exhaust Silencer Muffler Killer. 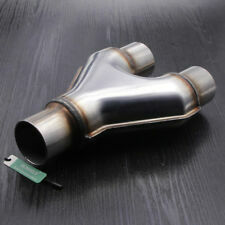 Tip muffler size: 4.5". Effectively reduce loud and deep tone from muffler. 1x Tip Muffler. Thread pitch:1.3mm. Material: T-304 Stainless Steel. 1 Exhaust Clamp. Material: Stainless steel. Color: Silver. Stainless Steel Exhaust Y Pipe Adapter Connector 2" Single to 2" Dual. Type:Exhaust Pipe. 1Pcs exhaust pipe. -Will not increase any load on the engine, installed in the car to improve the grade. -304 stainless steel, acid and alkali resistance, high oxidation resistance, durable, easy to clean. Size: 10m x 5cm x 2mm(approx). 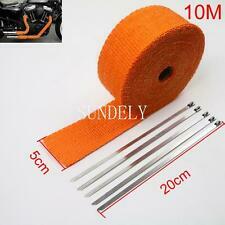 10 m Exhaust Header Wrap Insulator Turbo Pipe High Heat Tape Orange. Belong to product of dyeing, is likely to rub off, before installation to roll thick layers as far as possible, the effect will be much better. Stainless Steel Exhaust Y Pipe Adapter Connector 2.25" Single to 2.25" Dual. Type:Exhaust Pipe. 1Pcs exhaust pipe. -Will not increase any load on the engine, installed in the car to improve the grade. 1 Exhaust Clamp. Color: Silver. Repeatable disassembly installation. Flange Kit Height: 17.8mm(2x Flange 35.3mm). Clamp Height: 22mm. Material : Stainless steel & iron. -Instruction is not included. Type:Exhaust Pipe. 1Pcs exhaust pipe. -304 stainless steel, acid and alkali resistance, high oxidation resistance, durable, easy to clean. -High quality stainless steel thickened widened thicker anodized, more durable. Material: Glass Fiber. Color: Silver. Clamp Height: 19mm. Material : Stainless steel & iron. Flange Kit Height: 16.7mm(2x Flange 33.4mm). Product Features. Size : Length 7 2/5" (188mm). Improve The Look Of Your Vehicle. 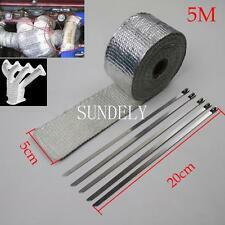 Sundely 5M Exhaust Header Wrap Insulator Turbo Pipe High Heat Tape. Material: Glass Fiber. Color: Silver. 2"/52mm Stainless Exhaust Adapter Sleeve Pipe Repair Connector. Suitable for a 2" (52mm) Tube/Pipe. quantity:1Pc Exhaust Connector. Length: 95mm. 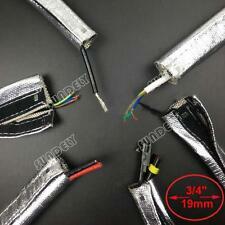 15m Exhaust Header Wrap Insulator Turbo Pi pe High Heat Tape Titanium Golden. Size: 15m x 2.5cm x 2mm. Color: Titanium Golden. Material: Glass Fiber. You may also like. Size: Length 7 1/5" (180mm). Improve The Look Of Your Vehicle. 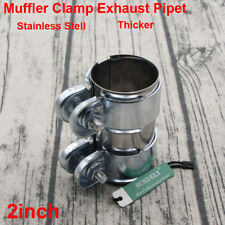 2.5"/66mm Stainless Exhaust Adapter Sleeve Pipe Repair Connector. Suitable for a 2.5" (66mm) Tube/Pipe. quantity:1Pc Exhaust Connector. Flange Kit Height: 17.9mm(2x Flange 35.8mm). Clamp Height: 22mm. Material : Stainless steel & iron. Product Features. Size: 10m x 5cm x 2mm. 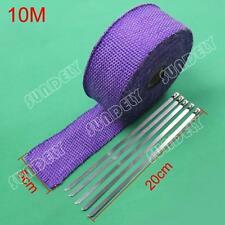 10 m Exhaust Header Wrap Insulator Turbo Pipe High Heat Tape Purple. Material: Virgin Glass Fiber. Color: Purple. Universal Insert Removable Stainless Steel Exhaust Silencer Muffler Killer. Tip muffler size: 4". 1x Tip Muffler. Effectively reduce loud and deep tone from muffler. Thread pitch:1.3mm. Material: T-304 Stainless Steel. Size: 10m x 5cm x 2mm. 10 m Exhaust Header Wrap Insulator Turbo Pipe High Heat Tape Red. Belong to product of dyeing, is likely to rub off, before installation to roll thick layers as far as possible, the effect will be much better. Size : 2"(51mm). 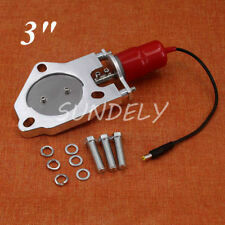 2" Electric Exhaust Catback Downpipe Cutout E-CUT Out Valve Motor Kit Stainless. Electric Cutout Kit - Made of Lightweight CNC Machined Anodized T-6061 Aircraft Aluminum Alloy. 1 x Electric Exhaust Cut Out Kit with Gear Driven Motor only ( No Instruction Included ). 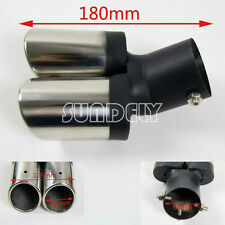 Universal Insert Removable Stainless Steel Exhaust Silencer Muffler Killer. Tip muffler size: 3.5". Effectively reduce loud and deep tone from muffler. 1x Tip Muffler. Thread pitch:1.3mm. Material: T-304 Stainless Steel. Sundely 16FT Exhaust Header Wrap Insulator Turbo Pipe High Heat Tape Blue. Material: Virgin Glass Fiber. Color: Blue. Size: 10m x 5cm x 2mm. Material: Glass Fiber. Color: Silver. Flange Kit Height: 16.7mm(2x Flange 33.4mm). Clamp Height: 19mm. Material : Stainless steel & iron. Product Features. 10 m Exhaust Header Wrap Insulator Turbo Pipe High Heat Tape Purple. Material: Virgin Glass Fiber. Color: Purple. 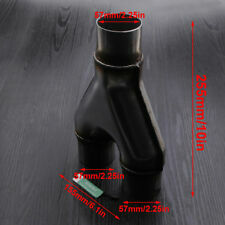 Universal 3" x 4" Exhaust Flexi Repair Flexi Pipe 76mm x 100mm. Save money replacing your old worn out front pipe and middle pipe with this flexi pipe. This flexi is a weld-on product. Most garages will fit it for you. New T3 Titanium Turbo Heat Shield /Blanket. Outer Made From Pulverized Lava Rock (Tough Titanium Outer Fiber Fabric). Underside Made From Pulverized Lava Rock (Tough Titanium Fabric). 1 X T3 Titanium Underside/Outside Turbo Heat Shield/Blanket. 15 m Exhaust Header Wrap Insulator Turbo Pipe High Heat Tape. Material: Glass Fiber. Color: Silver. You may also like. Electric Exhaust Catback Downpipe Cutout Cut Out Valve Motor 75mm 3"
3 " Electric Exhaust Catback Downpipe Cutout E-CUT Out Valve Motor Kit Stainless. Electric Cutout Kit - Made of Lightweight CNC Machined Anodized T-6061 Aircraft Aluminum Alloy. 1 x Electric Exhaust Cut Out Kit with Gear Driven Motor only ( No Instruction Included ).